Last year I took a crack at building the biggest and most complex Keen levelpack ever, 99 levels total. I got about 1/3 of the way through then my keening time evaporated. I may honestly not be able to do anything big again. So I whipped up this tiny scribble showing off a few small features I had set up. To show you how much my keening time has been cut out, this was planned for Christmas and is only about 1 day's work of wrapping up the levelpack thing. Extremely playable and instantly charming. The alignment function sure did come in handy. I beat it hoping for 99 levels more. So. Yeah, yeah, yeah. Glowing review. You've all heard it before, BUT JUST LOOK AT THAT PATCH FILE. ARE YOU GUYS SEEING THIS?! I love this puzzling game-idea. and hell yeah, what a freaking patch file!!! 1321 lines in total. there need to be some further more levels done. at least hoping for 90 levels more. besides: I pretty much love the pipe-like-design of the yet unfinished 10th one. the music files are neat, too. Last edited by Nisaba on Sun Jul 01, 2018 0:19, edited 4 times in total. Yeah, it has stuff not shown there, teleporters, duplicators, time freezers n' such. Dunno how long (if ever) it would take to complete, like I said Ive done the first 30 basic levels. Nisaba wrote: What's about a future coming level combined with this earlier KUBE-idea. Levellass wrote: In what way? I have quite a few completed levels lying around in the mod folder. well, thought about moving walls like these KUBE-blocks do. in some sence a variation of running out of time "...uh... hurry, uhhh... the walls are comming closer..."
a switch might affect the movement... but there are way too many possibilities. I'm curious about your others. especially the duplicators. I admire the Mink's Duplicators Puzzle Pack (with your patches included, right?!) so I hope to see some variation of this stuff too! Nisaba wrote: I'm curious about your others. especially the duplicators. The duplicator tile is quite simple, when an object is placed upon it and the duplicator's button pushed, a copy of that object, moving in the same direction with the same properties as the original object, moves off the duplicator tile and onto the level. After some experimentation it was decided being able to duplicate the player was a bad idea. Instead dedicated 'copycat' sprites can be used, including those that only copy you when you are in special ;copycat zones'. [color=purple]Sword of Fargoal wiki[/color] wrote: "Each dungeon is covered in complete darkness that illuminates as the dungeon rooms and corridors are explored. 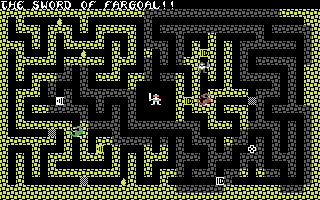 When the Sword of Fargoal is successfully found, a clock countdown begins where the player must successfully escape the dungeon without it being stolen before the time expires, or the Sword is lost." This is rather interesting. This feels like it has more potential than KUBE, at least with the Keen engine. There are some weird design choices that I didn't quite understand (a level that didn't need cubes to complete, the one where you can finish with one cube left and one cube taken by the ghost), but between what's presented here and the other stuff you've described, consider my curiosity piqued. If you can figure out how to make Keen wrap around solid corners without having to use the Ctrl key to snap him to the grid, I imagine that the enhanced fuildity would probably retain more players' interest, as minor a quibble as it is. I have no idea how feasible such a patch is, though. What's been done here is already impressive. Oh, there's a suicide command too if the ghosts or enemies nom your stuff. Plus you can advance to the next level if you fail enough. Since cube counts and time are both customized in each level some levels just have beta testing values and are thus much easier to beat. Like I said, this was just thrown together. I could show you a video of the first level of the actual mod if you'd like so you can get a feel for how everything was going to be set out. The movement is a bit of a sod, yes. You'll notice the enemies move square-by-square, but getting Keen to do so was tricky. If desired I could patch in a 'square mode' that changes Keen's movement to always align with the grid, you'd lose some maneuverability while using it though. RemoveObj: Tried to remove the player! I would totally be interested in a video. Moving tile-by-tile isn't necessarily a terrible solution for a retro puzzle/maze game. Alternatively, if there's some way to repurpose the routine(s?) that handles slanted world map tiles... Yeah, I probably have no idea what I'm talking about. That's a feature. It's the authentic suicide experience. Ohhh, now I understand. Forgive me, for I am a mere cretin, baffled in the face of true art. Plasma Captain wrote: Ohhh, now I understand. Forgive me, for I am a mere cretin, baffled in the face of true art.